The CRT200 – Cable Retrieval Tool is a subsea cable gripper. It is also a lifting tool for recovering subsea cables for offshore wind, decommissioning and telecoms cable lay projects. The CRT200 Cable Retrieval tool is a subsea cable gripper. 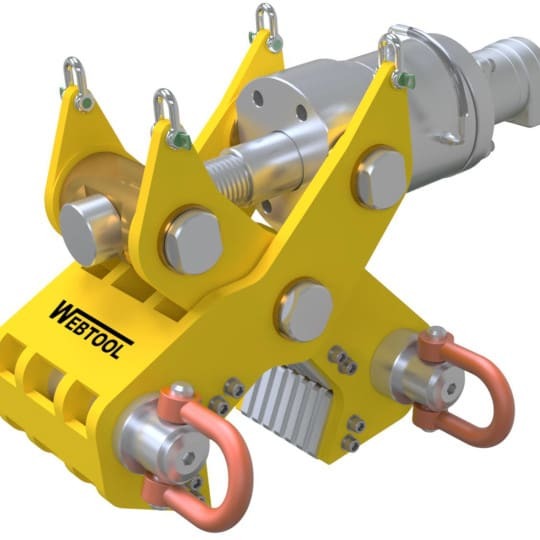 It is also a lifting tool for recovering subsea cables for offshore wind, decommissioning and telecoms cable lay projects. Hydraulically operated subsea cable gripping and lifting tool for retrieval and decommissioning projects. Corrosion resistant steel and stainless steel construction. Mechanically locked gripping action to ensure cable cannot escape during retrieval. Internal clutch mechanism to prevent over tightening. Lifting/gripping capacity – 20 tonnes. Jaw capacity – 6″ to 8″ diameter cable. Designed, manufactured and tested in accordance with DNV GL standards. Suitable for lifting cables and umbilicals. The standard subsea cable gripper tool is shown above. Here at Allspeeds Ltd we can offer a range of bespoke and custom designs to suit any special application. Speak to one of our team as they are available on request. We can even create an entirely bespoke subsea cable tool for your application issue. If you would like more information about the CRT200 subsea cable tool or any other of our subsea cable gripper tools, then please contact us for technical questions and support or Download the Brochure. You can also call our friendly team on 01254 615100 or email info@allspeeds.co.uk, they would be happy to help you!